“Dispersed Presence: Transforming Long Kesh/Maze” is a collaborative social sculpture by artists Martin Krenn and Aisling O’Beirn, exploring the future of the Maze/Long Kesh site beyond its current state of limbo. The former prison has both a physical presence and conceptual importance. Indecision about its future at government level says much about the political climate of a “post-conflict” society. Given this, the artists are interested in how one can think beyond the site’s legacy and to its future. The artists invited individuals and groups, with a first hand experience of the prison, such as ex-prisoners, former visitors, ex-prison staff and community museums from across the political spectrum to partake in the project. The artists worked with those that joined the project, to collaboratively photograph existing prison artefacts or to co-create unique small sculptural objects to reflect their personal experiences of this site. Techniques for creating the new objects include methods traditionally used in making prison art. Three principal dialogical methods for working with diverse participants were devised specifically for this project: restaging (whilst occasionally repairing), reappropriation and retelling. The aim was to avoid negatively dwelling on the past or the reiteration of previously rehearsed and ideologically overdetermined narratives. Krenn and O’Beirn worked with participants to photographically restage objects from the prison, which they made, own, or are caretaking for the future. With the participants playing an active role in the task of image making, each object was placed in a mobile photo studio and a draft of the accompanying statement, outlining their relationship to the object, was recorded. The “naming process” was spontaneous as participants were then asked to title and date the respective artefact, for a label made on site with a small portable labelling machine. The label was placed within the image frame, before photographing the object. Thus, naming became as integral as the object to the restaging process. 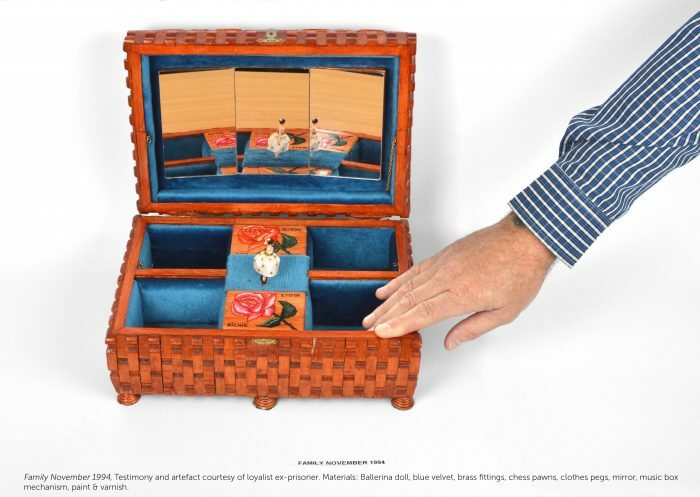 The next method, reappropriation, addresses lost objects and images and was tailored to point to the temporal nature of remaining prison artefacts and the time limits on 1st hand testimony. Here the artists employed materials and methods traditionally used in making prison art to create new artefacts which echo participant testimonies. The third method, retelling, is based on a long-term collaboration with the 50+ Group. This group of women meet weekly under the umbrella of Tar Anall, an organisation dedicated to the welfare of republican ex-prisoners and their families. The women were politically active as well as visiting their republican prisoner relatives. Krenn and O’Beirn not only photographed their extensive private collections of artefacts using the restaging method, but the group also made new objects with the artists. They employed methods traditionally used by prisoners as a way to testify their experience of prison visits, thus retelling an “other” story of Long Kesh/Maze from their unique female visitor perspective. Free event with project artists Martin Krenn and Aisling O’Beirn, curator Suzana Milevska and Peter Mutschler. This “in conversation” led by art theorist and curator Suzana Milevska and PS² organiser Peter Mutschler will take place with artists Martin Krenn and Aisling O’Beirn. They will discuss dialogical art practices in relation to the Dispersed Presences exhibition by Krenn and O’Beirn with opportunities for questions from the audience. This is a free event all welcome. Nora Landkammer and Karin Schneider from the TRACES project will conduct a workshop / focus group discussion on educational questions / methodological possibilities in the context of the Transforming Long Kesh/Maze project and its exhibition Dispersed Presence. Landkammer and Schneider will propose art-educational methods for how to work with this material; together, with workshop participants, we will try out how this material could be used to deal with stories about conflicted histories relating to the Long Kesh prison context. After the workshop the participants will reflect together on the methods, the material, the whole project and its merits and possible issues/open questions. We will ask together how and on what point the proposed art-based material and art educational methods can be used in your working fields such as teacher training, university education, schools, etc. Based on this discussion we would develop some ideas of how to re-design some of the ideas and materials so that it can be used in future educational contexts. The 50+ Group, David Stitt, The Andy Tyrie Interpretive Centre, The Eileen Hickey Irish Republican History Museum, The Roddy McCorley Society Museum, Simon Bridge, Phil Holland, The 50+ Group and various private collections and individuals. Martin Krenn and Aisling O’Beirn are artists who have worked in the field of socially engaged art for more than 15 years. O’ Beirn is based in Belfast and teaches at Ulster University, Krenn is living in Vienna and teaching at the University of Applied Arts Vienna. Their work is being supported by the archaeologist Laura McAtackney.